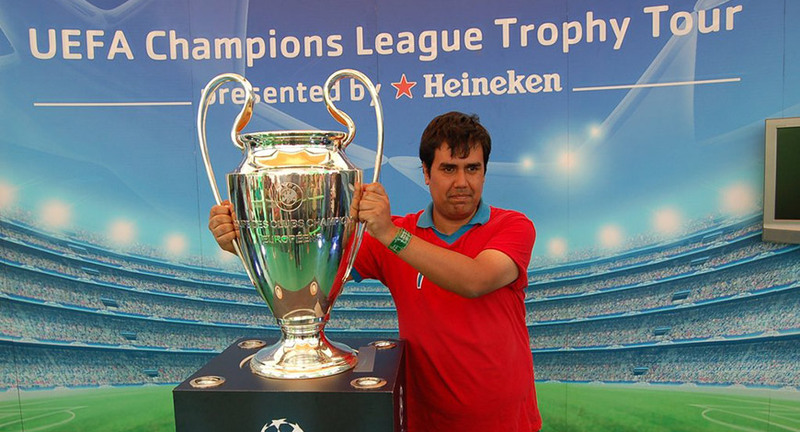 Football fans in Mumbai rejoiced as they won the honour of hosting the UEFA Champions League Trophy Tour presented by Heineken in India. Heineken continued its 'Champion the Trophy' campaign in India by giving local football fans a chance of a lifetime to host and unveil European club football competition’s most coveted prize - the UEFA Champions League Trophy in their city for the first time in the program’s eleven year history. The UEFA Champions League Trophy, known as the Holy Grail of club football will be unveiled by former UCL winner and Liverpool FC player Luis Garcia in the presence of Indian football superstar Sunil Chhetri at the Mahalaxami racecourse on April 10, 2017 in the morning. Post the unveiling, eight lucky fans chosen from a Twitter contest will get a chance of a lifetime to play a match with Luis Garcia and Sunil Chhetri, in a five-a-side football game on April 10 at the Turf Club. Players will be assigned to team Garcia and team Chhetri, as they will go head-to-head in a clash of legends. Mumbaikars could get a chance to be a part of the unveiling and witness the match. For details, log on to @Heineken _IN on Twitter and @Heineken on Facebook. Speaking about the campaign and Heineken’s association with the UEFA Champions League, Samar Singh Sheikhawat, Senior Vice-President (Marketing), United Breweries Limited, said: “For true football fans the iconic UEFA Champions League Trophy is the holy grail of the footballing world. Only the best football players in the world get to hold this symbol of the highest level of accomplishment in the sport. Heineken® is bringing the excitement of one of the most celebrated global sporting prizes for fans in India, through the UEFA Champions League Trophy Tour and creating engaging fan experiences that go beyond the 90 minutes of the match”. The UEFA Champions League Trophy Tour presented by Heineken will make its way across the bustling city of Mumbai, giving fans a chance to witness the glorious trophy. The trophy will make its first pit stop at Shivaji Park, followed by Carter road, moving to BKC (Bandra Kurla Complex). Fans can be part of the Heineken® Trophy Tour experience by participating in a variety of engaging activities at the pit stops, where they stand a chance to win exclusive Heineken merchandise. The tour will end at its final destination at the Taj Lands End, Bandra. This will be followed by the Trophy Tour Party, an evening of glamour and sports which embodies the Heineken spirit of opening new worlds. Mumbai was chosen for the UEFA Champions League Trophy Tour through a Twitter contest by Heineken across four cities (Delhi, Mumbai, Bangalore, Kolkata). The contest encouraged fans from each city to tweet, vote and compete for their chance to host the trophy. Each city was given a specific hashtag, for example: #ChampionTheTrophyBLR– for Bangalore, #ChampionTheTrophyMUM – for Mumbai, and fans battled it out online with the maximum tweets to win the rights to unveil the trophy in their city. The competition was close, but after days of continuous voting and tweeting, the city of Mumbai emerged victorious.